As we all witnessed yesterday Syria’s foreign minister Walid Muallem said thatSyria will offer to help the US fight the Islamic State (IS) militant group. This of course has left the so called Anti-war camp and “Anti-Imperialist” left in the U.S/West and even Arab assadists that support Assad either confused or silent on the matter. It’s important to note these are the same leftists or as some call them ‘tankies’ that support Russian imperialism and Iranian mini-imperialism in the Middle East and don’t even care whether Russia is a capitalist oligarchy or if Iran has communist political prisoners in its jails or killed because of their ideas this shows you how unprincipled they can be by becoming reactionary by supporting bourgeois nationalism and fascism. This article will focus on the many ways to break the regime’s “resistance” and “rejection of U.S/Western Imperialism” narrative and a way for critically think about Syria and the peoples mobilization against the regime. Beginning in the 1980’s Hafez Al-Assad began implementing neoliberal policies and especially in 2005 where the “social-market economy” was introduced which was according to Professor Omar S. Dahi This “was more market than social”. This type of authoritarian neoliberalism caused a crisis and mass poverty and unemployment where the peasants in the country side and the proletariat in the city suburbs and working class neighbourhoods suffered and these include the rise of “informal housing” or slums where people were forced in because the rent and housing prices and gentrification rocketed in Syrian cities they people were left in despair and it’s not surprising that when the protests broke out in Tunisia, Egypt the Syrian people saw that they had nothing to lose and rose up against the regime. According to syrian regime narrative it has always been a “resistance” and “Objector to Zionism and U.S Western Imperialism” now we know from it’s history that it is far from that. Beginning with the Golan Heights a Syrian territory occupied by Israel Hafez-Al Assad never bothered to fight to return it and left it under occupation and zionist settler-colonisation. During the Lebanese Civil War Hafez-Al Assad and the Syrian Army led a war on Palestinian refugee camps which resulted in the deaths of many Palestinian civilians and was condemned by Palestinian revolutionaries like George Habash the founder of the PFLP who was critical of the regime in this video he criticizes the syrian regime for being a tool of zionism and imperialism and the regime being a killer of the Palestinian people next to israel. Now recently his son Bashar Al-Assad launched his own war on the camps in Syria with siege and shelling of Yarmouk Refugee camp and other camps. like Ramel in Lattakia and Dar’aa camp in southern Syria, Homs Al’Aiddeen camp and Handarat Aleppo camp where many of the inhabitants were killed, starved and made refugees again. The Assad regime has always served U.S/Western Imperialism besides the recent offer to aid to U.S strikes on I.S it collaborated with the U.S in the gulf war and under Bashar looked to re-establish ties with Israel. Also we can’t forget that the Syrian regime and it’s mukhabarat (intelligence services) worked with the C.I.A to torture on people on “extraordinary rendition” like the case of the Syrian-Canadian citizen Maher Arar who was kidnapped, deported and sent to be tortured by the syrian mukhabarat. This has to be always repeated the Assad regime is a bourgeois nationalist, capitalist and social chauvinist state that has always repressed any dissent against it with the use of it’s Mukhabarat (intelligence services) and especially the air force intelligence, Army and Shabiha (Regime backed Death Squads). Yes the Assad regime is Anti-Communist which is not surprising since the 1970 coup by Hafez Al-Assad was a right-opportunist and reactionary takeover against the Marxist and leftist Salah Jadid. The Regime has cracked down on many communist groups especially the Syrian Communist Action Party it has a Maoist tendency and was heavily repressed in the 70’s and 80’s by the Syrian regime and many of its cadres were militants in the 70’s student radicalism especially in Aleppo University where it was centre of a revolutionary organization. Also the regime heavily repressed Palestinian groups like the Palestinian Popular committees which was established in the 80’s and supported the Syrian communist action party and other leftist and communist militants the group had many of its cadres killed,arrested and tortured in Syrian regime prisons. And many of these militants were from all sects especially the Alawite, Sunni, Ismaili, Druze,Shia and Christian sects. Regarding the Kurdish people the syrian regime prisons have always been filled with Kurdish political prisoners and the regime itself denied Kurds citizenship and cultural and linguistic rights. Syrian communists in jail include Abd al Aziz al Khatyyer, Jihad As’ad. Also the Palestinian filmaker from Yarmouk camp Hassan Hassan who was tortured to death by the regime. The Assad regime is no different from the Somoza, Pinochet, Suharto and Kuomintang regimes it should be condemned by every Marxist-Leninist, Anti-Imperialist, leftist and socialist. 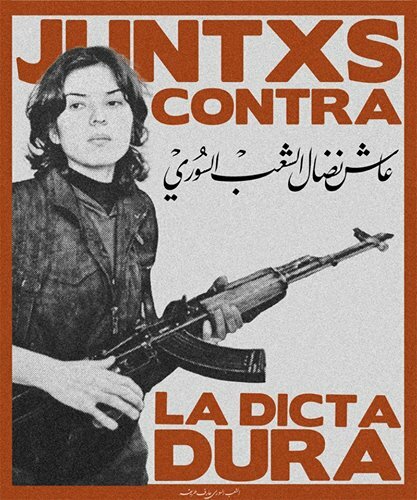 The Syrian Communist Action Party is part of the National Coordination Committee for Democratic Change a front of left-wing parties and organizations who oppose the regime and seek to overthrow it. There is also the PYD (People’s Protection Unit the military wing of the Kurdish leftist Democratic Unity Party which has declared peoples war on the regime taken control of Kurdish neighbourhoods in Aleppo and northern Syria or Western Kurdistan (Rojava) and built an autonomous self-governed region and has been fighting both the Assad regime and (I.S). Regarding non-Kurdish leftist groups who gave taken up armed struggle the Syrian Revolutionary left Current established the People’s Liberation Faction to commemorate the third anniversary of the Syrian revolution. Also these include the L.C.C (Local coordination committees), Left-wing and communist organizations like the Syrian leftist coalition and Syrian Communists. All these parties and organizations are Anti-Imperialist opposing U.S/Western Imperialism and the Arab Gulf states are part of this and Iranian-Russian Imperialism in the country and are struggling against them. Usually an assadist “leftist” will tell you that there is a communist party in the Syrian parliament yet fails to understand that the syrian communist party-Bakdash is a reactionary tool of the regime and the ruling class in Syria. Comrades and friends, let’s put an end to this Anti-Imperialism of fools and be principled to our ideals and not fall into supporting those who blindly back the fascist,social chauvinist and bourgeois nationalist Assad regime that is oppressing the Syrian masses we have to unite and support the syrian people’s struggle and progressive forces of Syria against the Assad regime and Imperialism whether it is US/Western Imperialism, Russian imperialism or Iranian and Arab gulf countries interventions in Syria.